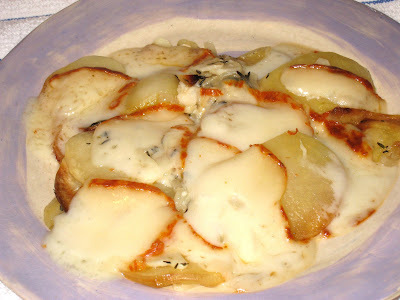 I forgot that I had taken this picture of my Potatoes Annabella with cheese melted over the top. It was truly delicious. I wish I could remember what cheese this is. I got it at Treasure Island, so I hope I can find it again. I thought it would make a good melting cheese for grilled cheese sandwiches. I was right - it's a great cheese for melting, with a mild, nutty taste.